If you're trying to implement Agile and Scrum into your development team, read on for the basics of Scrum works, with details on product backlogs, Scrum Masters, etc. Wondering how Rugby relates to Scrum? In this post, we’ll examine the Scrum development framework, its benefits and disadvantages, and some best practices for Scrum software development. When you’re ready to manage your development process with the Scrum methodology, check out this post for our analysis of 15 Scrum boards you can use to manage your workflow. The word Scrum is also used in rugby to define a play where players struggle against each other to gain possession of the ball. 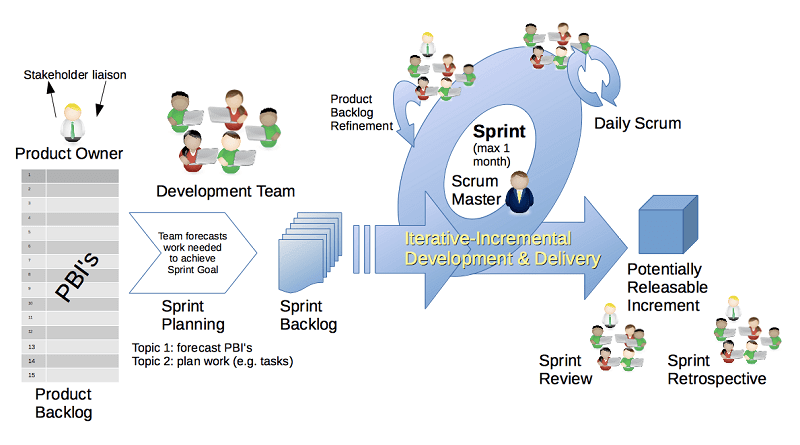 The goal of a Scrum in software development is to perform at a high-performing level like a rugby team does in a scrum. The goal of each Sprint is to create a sellable product. The Scrum Master keeps the team focused on the goal. The Scrum Master is part of the Scrum team and makes sure the team works in compliance with the Scrum rules. They are not a manager. The Product Owner represents the customer. This role prioritizes the backlog and coordinates the Scrum team's efforts. The Product Owner is a role similar to a project manager in more traditional project management frameworks. Each Sprint produces a product that is ready to go to market even though the project is ongoing. The highest priority requirements are addressed first, so a high-quality, low-risk product can be on the market. Allow the teams to self-organize around people’s skills, work styles, and personalities.